Since launching in 2009, the Home Affordable Refinance Program (HARP) has evolved. HARP’s most recent iteration, HARP 2.0, makes the refinance process simple — no appraisals, few verifications, and financial incentives for taking a 15-year fixed rate mortgage. Yet, as some HARP 2.0 applicants discover, despite meeting government loan guidelines, their underwater mortgages may not be HARP-approved. A number of U.S. banks use tactics known as “investor overlays” to turn down an otherwise-qualified loan. This is especially common among HARP mortgages with private mortgage insurance (PMI) and lender-paid mortgage insurance (LPMI). If you’ve been turned down for the Home Affordable Refinance Program because of your loan’s PMI or LPMI, don’t give up. You still have options to refinance. Click here to get a HARP mortgage rate (Apr 20th, 2019). The HARP refinance program is an economic stimulus plan, meant to help U.S. homeowners refinance. HARP was launched in 2009 as a component of the broader Making Home Affordable program. The Making Home Affordable program is still in effect today, and aims to help U.S. homeowners get access to lower mortgage rates, lower mortgage payments, or both — all with the cooperation of the nation’s mortgage lenders. The HARP program is Making Home Affordable’s “refinance product”. Via HARP, the government gives “responsible” homeowners access to lower mortgage rates regardless of how much home equity the homeowner has; or has lost. The program is part of what the White House now calls “a better bargain”. As of May 2013, the typical HARP refinance reduced monthly mortgage payments by 35% or more. When HARP was first released, homeowners in states hard-hit by the housing market downturn were expected to get the most relief. These states included California, Arizona, Nevada and Florida. However, because the original HARP release — HARP 1.0 — limited HARP loans to 125% loan-to-value, few homeowners in the “Sand States” were actually eligible. Homeowners needed loans which allowed unlimited LTV. The program limits of 125% were too low to be effective. This was a compelling force behind the government’s decision to overhaul the HARP refinance in late-2011. The new HARP iteration was dubbed HARP 2.0, and it was a hit. There was another big change, though — one related to private mortgage insurance. In HARP 1.0, homeowners whose existing mortgages required PMI — either borrower-paid mortgage insurance or lender-paid mortgage insurance — faced a list of underwriting obstacles which often resulted in a mortgage loan turndown. Few loans with PMI were closed under HARP 1.0, as a result — mostly because of “the hassle” to get a PMI-backed loan approved. With HARP 2.0, those obstacles have been lifted. PMI should not obstruct your HARP loan approval. HARP 2.0 permits U.S. homeowners to refinance loans with PMI — both borrower-paid and lender-paid. However, not all lenders are underwriting to mortgage program guidelines. Home Affordable Refinance Program guidelines stipulate that loans with existing PMI may be refinance, but that the amount of PMI coverage must be at least equal to the coverage on being replaced. This doesn’t mean that PMI costs will be the same — it just means that new loans must protect lenders against the same amount of loss. The steps to replace existing PMI coverage can be time- and process-intensive, though. Sometimes, replacing the existing PMI coverage of a HARP loan can be completed in an hour. Other times — as with cases of existing lender-paid PMI — replacing coverage can require 3 weeks or more. For this reason, some U.S. lenders avoid the HARP program altogether if the mortgage to be refinanced has PMI of any type associated with it. It takes too much time to refinance a PMI-backed loan, they imply. Thankfully, not all lenders take this approach. 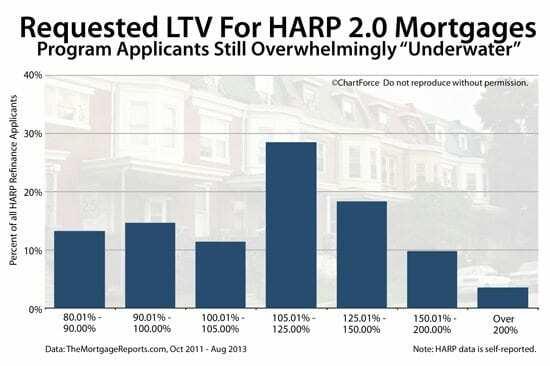 When your HARP mortgage application is denied because of PMI, just try another lender. You may get a better result. The good news for today’s HARP homeowners is there are plenty of banks that will do HARP loans with PMI. The hard part, though, may be finding them. They’re not always the banks you find around town and in your supermarkets. Even today, HARP remains a specialty product. And, with millions of U.S. homeowners program-eligible, it’s a great time to re-apply to HARP and start saving on your mortgage. Rates are available online and they’re free. No social security number required. As the popular HARP program ends, FHFA will roll out a new program that will give more underwater homeowners the chance to refinance. The Home Affordable Refinance Program launched in 2009. Seven years later, homeowners still ask the same 7 questions. Get the straight scoop on HARP. Easy-to-read HARP 2.0 mortgage guidelines with 2017 HARP mortgage rates attached. The latest news, plus live mortgage rates. Safe and secure.